My vegetable garden was a complete flop this year. Probably due to the excessive heat we had. Luckily, I have a Farmer's Market nearby where I can get lots of fresh produce. I have been waiting for the little kirbys to arrive so I can make my pickles. They finally came in yesterday! I recycle old pickle jars to put these up. These are very quick to make, crunchy and garlicy! Place cucumbers in a large non-reactive container. Combine 1/2 gallon water with 1 cup salt, and stir until salt is dissolved. Pour over cucumbers. Cover and refrigerate overnight. I put them in a gallon zip-lock bag. Drain and rinse the cucumbers, discarding brine. Boil jars or run them through the dishwasher to sterilize. After brining, if any of the pickles look or feel soft and mushy, discard them. Pack into wide-mouth jars. 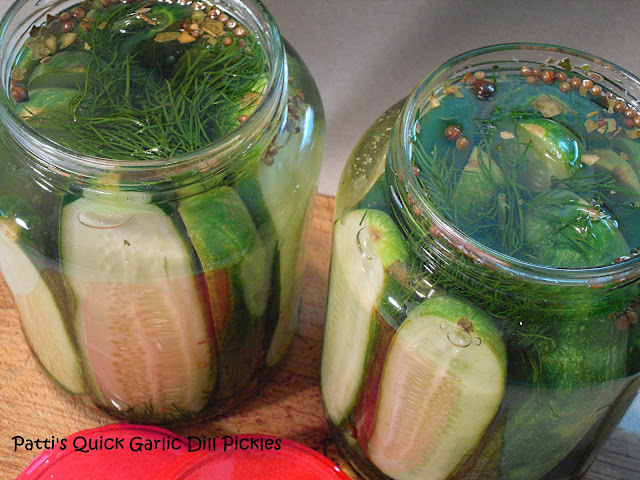 Divide pickling spices, garlic and dill between the jars. After packing jars, put additional dill on top of the pickles. Combine 6-1/4 cup water, remaining salt, vinegar and sugar in a medium saucepan. Bring to a boil and pour into packed jars. Cool on a rack to room temperature. Cover and refrigerate. These are best eaten after about 2 weeks, but you can start after 2 days in the refrigerator. It's hard to wait! This makes about 4 Quarts. I'm the founder/moderator for Punk Domestics (www.punkdomestics.com), and I'd love for you to submit this to the site. Be sure to tag it #pickleparty. Good stuff! I cant wait to make up a batch of my own! Looks like a great recipe, Patti! Love your photo! The hardest part of making pickles is finding some good kirby cukes! Those look delish! I wanted to invite you to our Canning Week Blog Party (Aug. 22-26). http://alattewithotta.blogspot.com/p/canning-week-2011.html There will be a canning linky party with a guest judge, and canning related give-a-ways. It should be a lot of fun and I hope you will stop by and link up!!! Hi Lisa! I did leave out the sterilization - you can boil them or run them through the dishwasher to sterilize. Slice the cucumbers after removing them from the first brine! Oh yum! Thanks for linking this up at the Carnival of Home Preserving!